2020 Honda Accord Hybrid sedan unveiled for the ASEAN market - India bound? 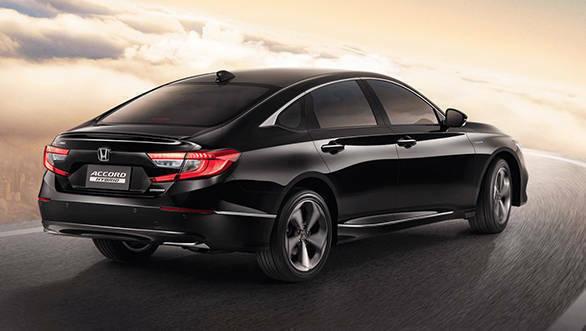 The updated 10th generation Honda Accord sedan and the Honda Accord Hybrid sedan has been revealed before the 2019 Bangkok International Motor Show. The new car gets cosmetic changes and new drivetrains. 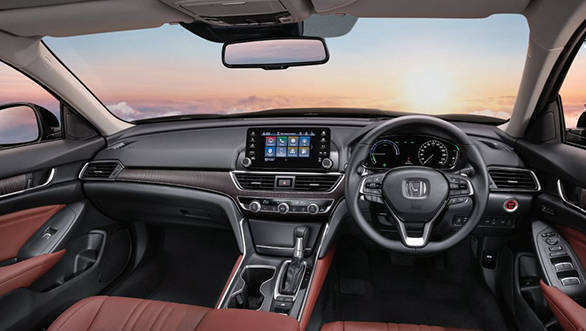 The styling on the new Honda Accord is inspired by the company's family design - similar to the recently launched Honda Civic and remotely related to the second generation Honda Amaze. The headlamps are full LED units and a chrome grille which runs along with the width of the sedan. The standard car gets 17-inch alloy wheels whereas the hybrid model sports 18-inch alloys. 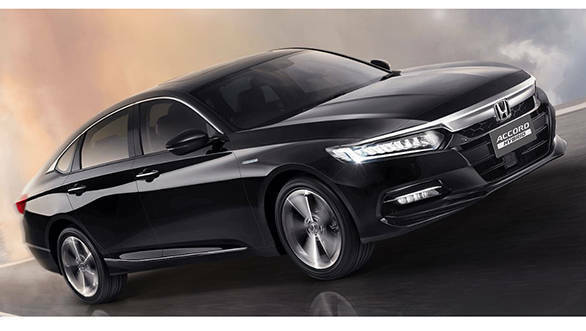 The roofline of the new Accord slopes down gradually towards the end and the side silhouette shows a three-box design. The taillamps wrap around the corner and get a C-shaped designed. Inside, an aggressively designed steering wheel with controls mounted on it grabs attention and a 7-inch TFT instrument cluster sits behind. The car gets an 8-inch infotainment system with Apple Car Play. A head-up display and a wireless charger are also on the feature list. When launched in India, we expect the Accord to be equipped with a lane-watch camera. The international car gets the Collision Mitigation Braking System (CMBS), Adaptive Cruise Control with Low-Speed Follow (ACC with LSF), Lane Keeping Assist System (LKAS), Road Departure Mitigation System with Lane Departure Warning (RDM with LDW), Auto High-Beam (AHB), Multi-View Camera System (MVCS) and Cross Traffic Monitor (CTM). The new Honda Accord offers a choice of two drive trains, a 1.5-litre turbocharged petrol that is good enough for 190PS and 243Nm. The claimed fuel efficiency for the turbo petrol engine is 16.4 kmpl. The other engine on offer is a 2.0-litre petrol engine with two electric motors which has a combined output of a 215PS and a fuel efficiency of 24.4 kmpl. Both the engines are mated to an automatic gearbox (CVT). 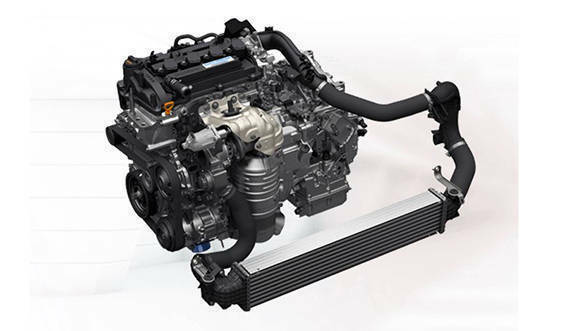 The hybrid engine offers different drive modes such as the, EV Drive Mode, Hybrid Drive Mode, Sport Drive Mode and Engine Drive Mode. Internationally the 10th generation Honda Accord is priced between Rs 32 lakh and Rs 39 lakh. Currently, Honda India sells the 9th generation in our market which retails at Rs 43.43 lakh ex-showroom Mumbai and rivals the Volkswagen Passat, Toyota Camry Hybrid and the Skoda Superb. Expect the 10th generation facelift to be launched in India by the final quarter of 2019 as the 2020 Honda Accord.